All eyes were on the T-Mobile Arena in Las Vegas on Saturday, May 7 asWBC, Ring Magazine and Lineal Middleweight World Champion Canelo Álvarez (47-1-1, 33 KOs) successfully defended his titles in a brilliant performance with a vicious knockout of former two-time world champion Amir “King” Khan (31-4, 19 KOs) in the sixth of 12 scheduled rounds. 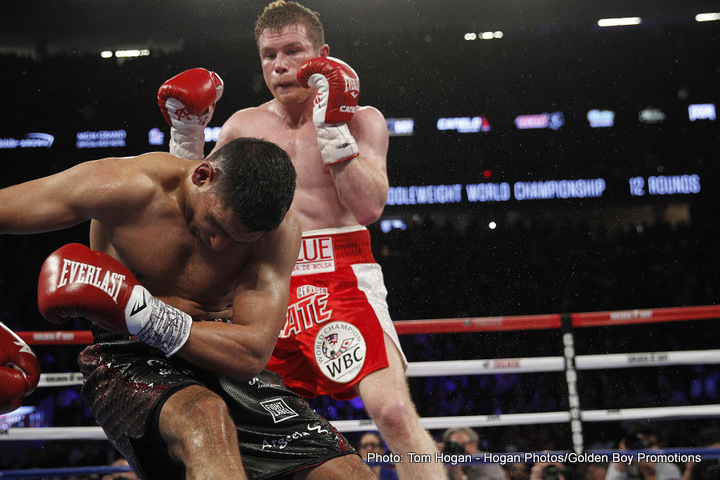 In the beginning, Khan’s speed proved to be tricky for Canelo, as he unleashed his famous ‘punches in bunches’ in rounds one and two. Attendance for the mega-event tonight at the new T-Mobile Arena was 16,540, and saw celebrities in attendance including singers Roberto Tapia, Billy Joel and Daddy Yankee, actor George Lopez, chef Gordon Ramsay, actor JenCarlos Canela, Dallas Cowboys owner Jerry Jones, actress Anna Paquin, Mario Lopez, former Spice Girl Melanie C, Metta World Peace, and model Ana Cheri. They were joined by boxing legends new and old including Roberto “Manos de Piedra” Duran, Evander “The Real Deal” Holyfield, Lennox “The Lion” Lewis, Fernando “Ferocious” Vargas, Mike “Iron” Tyson, Michael “Jinx” Spinks, Pernell “Sweet Pea” Whitaker, Luis “King Kong” Ortiz, Jorge “El Nino de Oro” Linares, Joseph “Jojo” Diaz Jr., Lucas “La Maquina” Matthysse, Andre “S.O.G” Ward, Andre Berto, Gabriel Rosado, Sadam “World Kid” Ali, and Gennady “GGG” Golovkin. Canelo vs. Khan, was a 12-round fight for Canelo’s WBC, Ring Magazine and Lineal Middleweight World Championships, is promoted by Golden Boy Promotions in association with Canelo Promotions and sponsored by “Cerveza Tecate, Born Bold,” O’Reilly Auto Parts, Casa Mexico Tequila, DOOM® — Fight Like Hell on May 13, and HANDS OF STONE: The True Story of Roberto Duran, in theaters this August. David Lemieux vs. Glen Tapia was presented by Golden Boy Promotions in association with Eye of the Tiger Management, and Patrick Teixeira vs. Curtis Stevens was presented by Golden Boy Promotions in association with Main Events. The mega-event took place Saturday, May 7 at T-Mobile Arena in Las Vegas and was produced and distributed live by HBO Pay-Per-View beginning at 9:00 p.m. ET/6:00 p.m. PT.